Although the use of choreography and associated patterns (such as the aforementioned) makes tons of sense in many use cases, I’ve come across a number of them where choreography can be impractical. Data needs to be collected and aggregated from multiple services -e.g. check the Microservice.io Composition pattern. Note that this pattern doesn’t necessarily implies that an orchestration is required. Could be that data is collected and aggregated (not transformed) into a single response. But if data collected from multiple sources needs to also be transformed into a common response payload, then it feels pretty close to one of the typical use cases for orchestration. The process is human-centric and can’t be fully automated. Basically at some point a human has to take an action in other for the process to complete (e.g. 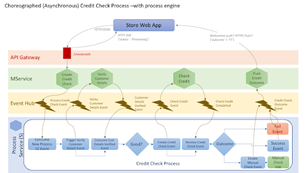 approval of a credit card application, or a credit check) -BPM/Orchestration tools tend to be quite good at this. There is a need to have very clear visibility of the end to end business processes. In traditional BPM tools, this is fairly straight forward, with Choreography / Events, although possible to monitor individual events, a form of correlation would be required to build an end to end view on the status of a business process. Read the complete article here.